In this lively alphabet rhyme, the letters of the alphabet race up the cocunut tree. Will there be enough room? 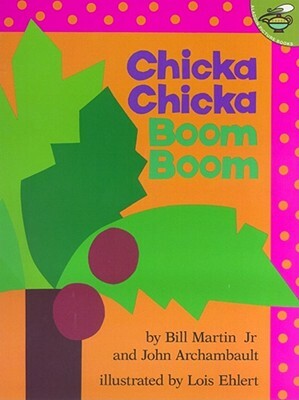 Oh, no - Chicka Chicka Boom! Boom! A told B, and B told C, I'll meet you at the top of the coconut tree. In this lively alphabet rhyme, all the letters of the alphabet race each other up the cocunut tree. Will there be enough room? Oh, no - Chicka Chicka Boom! Boom! The well-known authors of Barn Dance and Knots on a Counting Rope have created a rhythmic alphabet chant that rolls along on waves of fun. Lois Ehlert's rainbow of bright, bold, cheerful colors makes the merry parade of letters unforgettable. Bill Martin Jr (1916–2004) has been called “America’s favorite children’s author.” He wrote more than 300 books for children, including the classic texts Brown Bear, Brown Bear, What Do You See?, illustrated by Eric Carle; and Chicka Chicka Boom Boom, illustrated by Lois Ehlert. John Archambault is a poet, journalist, and storyteller who worked with Bill Martin Jr on several projects. He lives in Idyllwild, California. Lois Ehlert has created numerous inventive, celebrated, and bestselling picture books, including Chicka Chicka Boom Boom, Holey Moley, The Scraps Book, Mice, Ten Little Caterpillars, RRRalph, Lots of Spots, Boo to You!, Leaf Man, Waiting for Wings, Planting a Rainbow, Growing Vegetable Soup, and Color Zoo, which received a Caldecott Honor. She lives in Milwaukee, Wisconsin.